I know that A LOT of people have been blogging about Butternut Squash lately. (Almost as popular as refrigerator pickles in the summertime!) Does the world REALLY need another post about squash soup? Why yes, yes it does! For my "recipe" is actually a method, a way of tasting your way to the perfect soup. I adore preparing soup any time of the year because it is one of the more forgiving foods to improvise with. With a proper method at your disposal anything goes! You may remember that I hate to blend. I finally found a remedy for my itch to ditch the smooth stuff, I bought an immersion blender. I can tell that we are going to be SO happy together! Saute onion, garlic and peeled, chopped squash (Trader Joe's sells a bagged version of butternut squash that is AWESOME!) over low heat in butter until everything is a lovely light golden brown. Add salt, pepper, and herbs. (Thyme plays well in nearly every soup, nutmeg, or fresh ginger would also be welcome here) Add 1 quart of stock and cook over low heat until the squash is very tender. Either use your fabulous new immersion blender or transfer the soup in batches to a traditional blender. When your soup is nicely blended, taste it. Definitely add a spoonful of sweetener (brown sugar, honey or maple syrup). I highly recommend adding a creamy element. (a few table spoons of sour cream, creme fraiche, or just plain cream.) Taste again, adjust salty/sweet/creamy ratio as necessary and serve. I unfortunately neglected to take any pictures of the soup when it was in it's most photogenic state. 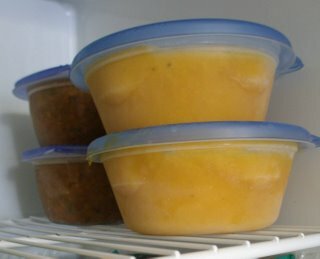 Now all I have to offer you is this picture of my secret stash of frozen soups. Thrilling! That looks like some dang tasty soup! By the way, my mom is now a huge fan of your blog. You're a star! We're just days away from one of my fave holidays and I feel the need to share this oddly delicious cranberry relish of NPR fame to EvieDee's loyal readers. Here, with Susan Stamberg's footnotes, is the recipe she reads on the air every year. Though it sounds disgusting, I assure you it is every bit y-u-m. The relish will be thick, creamy, and shocking pink.